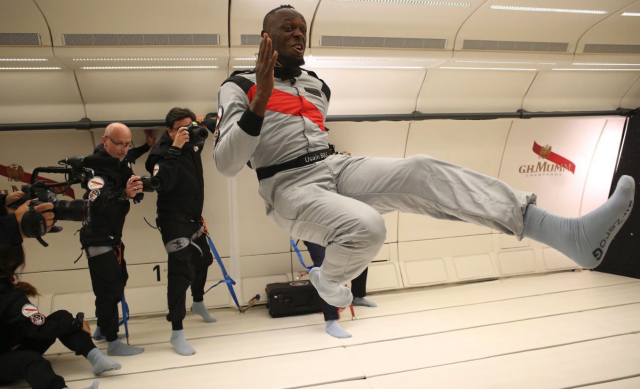 Former Jamaican sprinter Usain Bolt took high altitude training to another level yesterday, trying out Champagne Mumm’s Grand Cordon Stellar in zero gravity on board an Airbus Zero-G.
Bolt, who now plays for Australian A-League football side Central Coast Mariners, took to the skies above Reims to test out the new Champagne bottle which has been specially developed for use in zero gravity. Announced back in June, Mumm’s Grand Cordon Stellar is the result of a three-year project in partnership with space design specialists Spade. The specially-designed clear glass bottle uses the pressure within the bottle to expel the wine into a ring-shaped frame, when, in zero gravity, it looks like a droplet of bubbles. This droplet can then be gathered in a custom-made glass. “It’s a very surprising feeling,” Mumm cellar master Didier Mariotti said at the time. “Because of zero gravity, the liquid instantly coats the entire inside of the mouth, magnifying the taste sensations. There’s less fizziness and more roundness and generosity, enabling the wine to express itself fully”. The glasses, which are slightly concave and just five centimetres in diameter, catch the droplets of foam, with surface tension enabling the fizz to stick to the glass. 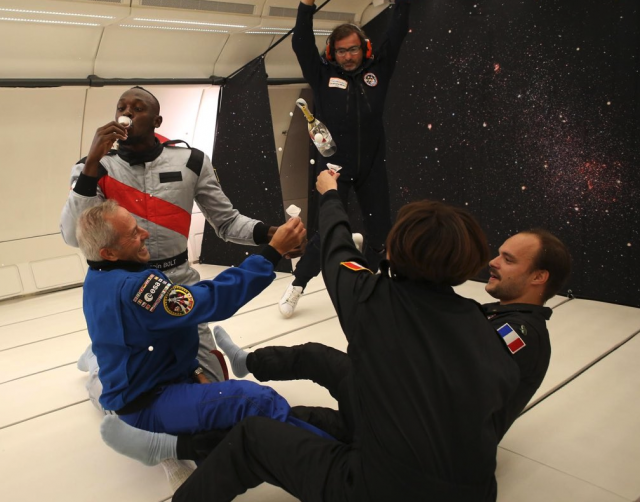 Proving he’s still got it, Bolt took part in a race with French astronaut Jean-Francois Clervoy and interior designer Octave de Gaulleas, coming out, as one would expect from an eight-time Olympic champion, firmly on top. 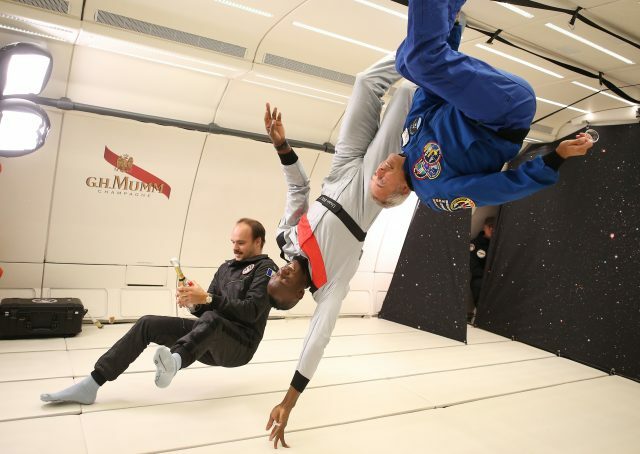 Mumm Grand Cordon Stellar will be served to guests on board zero gravity flights organised by Novespace, while the house says it is also in talks with other agencies to supply the fizz on future space missions and commercial space flights. Bolt was named Champagne Mumm’s CEO (chief entertainment officer) in November 2016.